No Rene Adler? Robin Zentner? 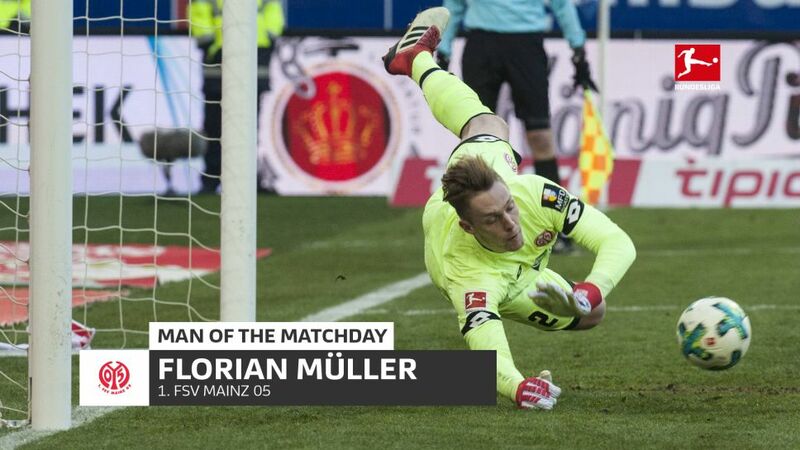 Who were Mainz going to call in the midst of a goalkeeping crisis? Step forward Florian Müller, the 20-year-old debutant who stopped a penalty and confidently stood his ground against a Hamburg shooting spree. "What Flo Müller did was amazing," Mainz coach Sandro Schwarz enthused after his ten men held out for a goalless draw in Hamburg in a relegation six-pointer. Few who saw the 20-year-old's first senior game for his club would disagree. Brought in as cover for the injured Zentner and the flu-stricken former HSV favourite Adler, the demands placed upon the shoulders of the keeper who joined Mainz as a 15-year-old were great. Yet straight from the off, Müller was in the zone. Sven Schipplock tested the waters with an early strike which the young goalkeeper parried away. Brazilian Walace tried next, and Müller was again equal to the effort. After tipping Filip Kostic’s strike onto the woodwork, there was a sense that something special was unfolding, and that Hamburg's day would ultimately be foiled by the brilliance of the inspired debutant between the Mainz posts. The visitors were reduced to ten men after the break, Leon Balogun giving up a penalty for which the Nigerian also saw red with his second booking. Kostic placed the ball and the Hamburg faithful expected. Yet down went Müller to save the spot-kick and out - it seemed - went the Red Shorts' hopes of finding a way past their new nemesis. In the end, the efforts at goal count read 18-3 in Hamburg's favour. Müller stopped all six HSV shots that were on target. "The team made my job easier so I was able to contain my nerves," the young 'keeper said after the scoreless contest. "For the penalty, I decided which way to dive early and I had prepared for that situation." It was a decision that maintained Mainz's seven-point advantage over opponents Hamburg at the bottom of the Bundesliga table, yet the 05ers remain in the relegation play-off position on goal difference behind Wolfsburg following their loss at home to Bayer Leverkusen. Click here for the Hamburg vs. Mainz Match Centre!